Obtain excellent software from the greatest webs sites! Check out called for software system and exceptional tools. Test package, public domain software, free programs, and demo programs to obtain in different types. On Softempire collections you may anywhen obtain a fresh utilities, or download the latest versions of your most liked PC and mobile tools, utilities programs, and securities tools. To download the desired package to get, try a simple catalog or a fine compendium. The Softempire accumulation is right away advanced: if there is the newest variation of utilities you seek, it is doubtless to be in the net richest applications catalogue! 4Easysoft PDF Cutter is a practical PDF splitter, which not only can cut PDF file, but also can cut PDF file by n page(s) and bookmarks. Also, it enables you to merge specific pages of original PDF file to create a new PDF file. What's more, you are allowed to divide PDF file averagely to several PDF files with same page numbers. You are allowed to define target PDF to be divided to small PDF ones with n page(s) respectively. Also, if target PDF file has bookmarks, you can flexibly choose the split level and customize the settings to split PDF files more efficiently. You can choose specific pages at random from original PDF file, then 4Easysoft PDF Cutter will help you to merge chosen pages to output a new PDF file. Plus, the rest pages of target PDF file can also be generated into a new PDF file if you choose the option. 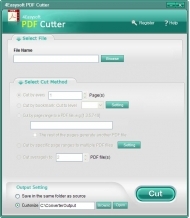 This PDF Cutter enables you to divide target PDF file into multiple PDF files by specific page ranges chosen by users. In Custom Settings window, you can click "New" to add any page of the multi-page PDF file in sequence. With intuitive and concise interface, 4Easysoft PDF Cutter can be easily used without any trouble or confusion. 4Easysoft PDF Cutter supports multi-language PDF, including English, Turkish, Thai, Latin, Korean, Greek, Cyrillic, Arabic, Japanese, and Chinese. This PDF Cutter has simple operation steps, so you just need few mouse clicks to operate it with fast processing speed and sound output quality. If your pdf ebook is restricted for print, edit or copy content on clipboard and you forgot the owner password of document, itâ? ?s time not to be panic, try pdf security remover and remove all the protection from pdf instantly.